I know that I’m like five years behind, but I’m loving this grain/power bowl trend thing. Put a bunch of stuff in a bowl and ta-da! dinner. Seriously, grab cornerstone items (protein/starch/veggies), garnish with all the fun stuff (hello, sauces and fixin’s), and you’re good to go. Plus, I am currently obsessed with these plate/bowls I bought from World Market last summer and I want ANY EXCUSE to use them. I got the inspiration for these Mediterranean Protein Power Bowls from my hospital’s cafeteria (seriously!). We are trying (ish) to implement Meatless Monday at our cafeteria for lunchtime. To help that happen, the chef puts out Greek/Mediterranean-style dishes (which are usually vegetarian-friendly) and a huge hummus bar. My lunch on Mondays is usually a container of hummus with a bunch of veggies, salad, and pretzel thins… basically everything that I can dunk in the chickpea/garlic deliciousness. 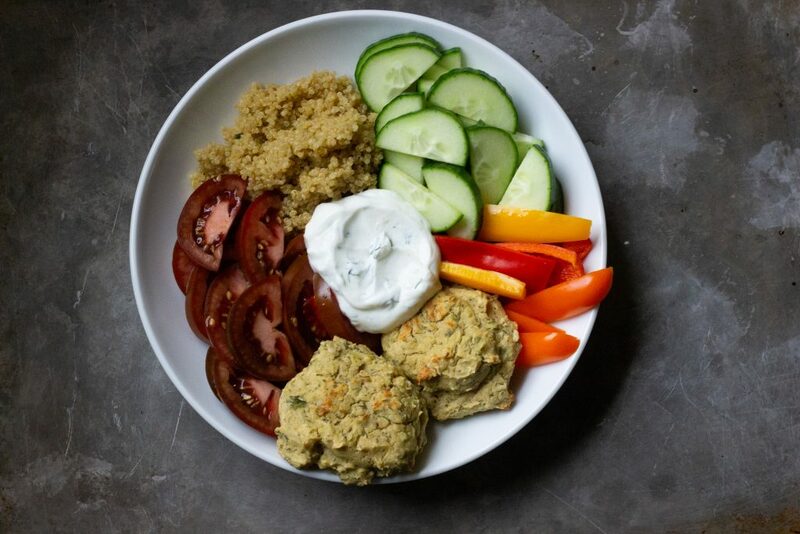 So I decided to riff off my Monday lunch and create a protein bowl featuring herby/garlicky falafel, quinoa, all the veggies, and a generous dollop of herby Greek yogurt sauce. It’s a delicious, healthy meal that is packed with flavor. And you can use your favorite bowls! The components come together very easily and can be made (or chopped) ahead of time! The two cooked components I made were falafel and quinoa. I really wanted to use a falafel mix because that is quicker/easier, but my store was OUT OF FALAFEL MIX. *sob* So I ended up making up some falafel on the fly (I made a riff of C it Nutritionally’s White Bean Falafels) – they were delicious (and just as easy as store bought mix). While the falafels were baking, I prepped all the other components of the bowls. Like some quinoa! And some Greek yogurt sauce! Then, when everything was all ready, I assembled my bowls. Two falafel, a scoop of quinoa, some sliced tomatoes (these brown/purple heirlooms were so cute! ), cucumber, bell peppers, and a dollop of Greek yogurt sauce! All the different flavors and textures are amazing and it comes together in no time! Plus, it’s packed with protein, veggies, and whole grains – the perfect combo to help you power through the rest of your day! Preheat oven to 375 degrees. Line a baking sheet with parchment paper and set aside. In a food processor fitted with a steel blade, add in all the ingredients up until the egg. Pulse until the beans are mostly broken down. Add in the egg and pulse until smooth. Dump the bean dough into a bowl and add in the flour, stirring to combine. The dough should be slightly sticky, but if it is very wet, add in some additional flour one tablespoon at a time. Portion out heaping tablespoons of falafel dough into the parchment paper-lined baking sheet. Press the tops down slightly. Bake the falafel in a preheated oven for 20 minutes, flip over, and bake for an additional 10-15 minutes until golden and crisp on the outside. Set aside if eating immediately or cool and refrigerate for later. In a small saucepan, add broth, salt, pepper, and thyme. Bring to a boil over medium-high heat. When the broth is boiling, add in the quinoa and stir. Reduce the heat, place a lid on the pot, and simmer the quinoa for 10-12 minutes or until the liquid has been absorbed. Turn the heat off and keep the lid on and allow the quinoa to sit for five minutes. Then remove the lid and fluff with a fork! Set aside for immediate use or cool and refrigerate for later. Combine all ingredients in a small bowl and stir to combine. Taste and adjust seasonings per preference. Keep refrigerated until ready to use. 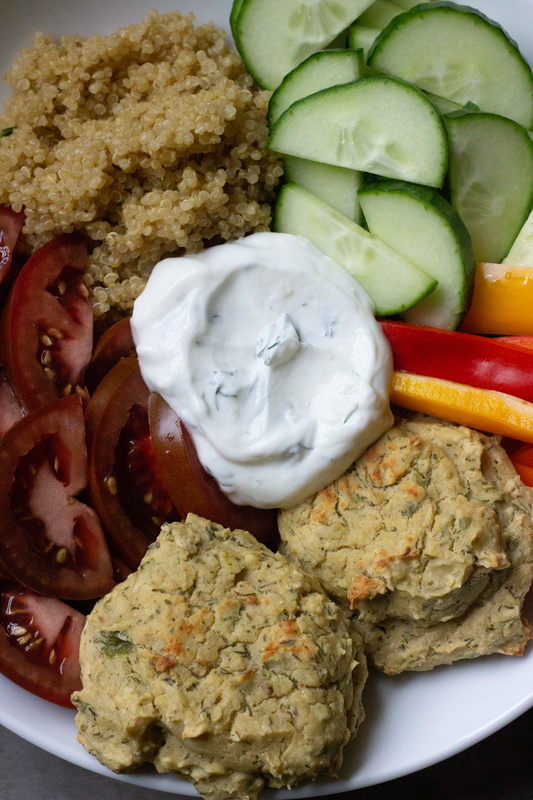 In a wide, shallow bowl, arrange falafel, quinoa, tomatoes, cucumber, and bell pepper in even sections. Add a dollop of Greek Yogurt Sauce to the middle of the bowl. Enjoy immediately.